I’ve always been intrigued by the Jeff Galloway Run/Walk method. I have had various times in my 8-year running career googled it to find out more. I have followed Jeff Galloway training plans in the past for different races – but without utilizing the run/walk method. I was curious though if applying the run/walk method might help me shave minutes off my half and full marathon times. I think my ego always got in the way of me giving it a go. Real runners run the whole thing right? Or at least until they hit the wall and have to walk. Then came Boston last year. My training had not been very focused leading up to the race. I arrived in Boston underprepared only to learn that I would also be contending with near-90 degree temps on race day. In fact the mercury so alarmed race officials that they were encouraging runners to defer their entries til next year. Tempting, but like most runners I opted to run the race anyway, seeing as I was there and had already spent a ton of money getting to Boston and staying for the weekend. I knew we were in for some fun when we were sweating to death just standing in the athlete’s village waiting for our wave to be called. After a couple miles into the course I knew that there was no way I was going to cross that finish line without a serious modification to my race plan. I made the decision to use run walk intervals. I started with 10min run/1 min walk intervals, but quickly decided that was a little too ambitious and shifted to 5 min run/run 30-60second walk. Despite experiencing symptoms of heat exhaustion and severe dehydration, I managed to stick pretty close to my intervals and cross the finish line in a little over 5 hours. A far cry from the 3:47 that qualified me for the race, but I was still thrilled considering the conditions and the number of runners I saw dropping out along the way. I honestly believe I owe my Boston Marathon finisher medal to the run/walk method. Without it I would have likely been carried off the course in a gurnee on that sweltering day. Recently I have begun using the Run/Walk method in training. I threw my back out bending over in early January, shortly before I was do run a destination 1/2 marathon in Phoenix. After having to scratch my trip and about a month of rehab, I was eager to start running again, but knew I had lost a significant amount of cardio fitness, and wanted to be smart about easing back in. I decided the Run/Walk method would be the best way to get started. ChiRunning and ChiWalking lend themselves nicely to smoothly transitioning between the two techniques. After a couple of successful weeks of run/walk workouts, I have decided to stick with the method to train for my next half mary in early May. I am curious to see if the run/walk method can not only help me to ease back into training after a layoff, but also if it can help me to improve my overall race times. My last half mary was in September with a time of 1:57, my PR in the distance came 2 years ago at a 1:44. I would like to come in somewhere between the two for this race, maybe 1:50? I will keep you posted on my progress. To Boston or Not to Boston? That is the question. Well, I was surprised to find out last week that I may have actually qualified for the Boston Marathon and not realized it! I am currently 38 years old, and being a runner who had recently developed hopes of running Boston one day, I knew that for a female 35-39 years old the qualifying time is 3:45:59 or less. That was the extent of my knowledge on the subject. I ran the Chicago Marathon on 10-10-10 and came up a little short of my goal, with a time of 3:47:23. Yes, it was a little disappointing to fall only 84 seconds short of my BQ time, but it was a very warm day, and I felt really good about my time considering the conditions. I figured I would try again for my 3:45 on hopefully a cooler day next year. In doing some research into 2011 marathon possibilities, I stumbled across an asterick that may have changed the impact of that 3:47. “Accuracy of these qualifying times is not guaranteed, as an individual’s age group is determined by their age at the time of the Boston Marathon in which they compete.” Hmmm…. Immediately I went on to the BAA website to verify…yep, it seems your qualifying time is based on the age you will be at the time the Boston Marathon is run. Now, I will only be 39 at the time of Boston 2011, so I did not qualify for that. However, I will be 40 (by only a matter of days) when the 2012 Boston Marathon is run on April 16, 2012. Well, the qualifying time for women 40-44 is 3:50:59, hence a 3:47 would be good for the 2012 race. Now the next question is: will a time posted in the 2010 Chicago Marathon count for 2012 Boston Qualification. Well, this is where the “may have” comes in. In the recent past, yes, two years worth of Chicago times would qualify you for the Boston Marathon. For example for 2011 Boston, you could use a qualifying time from 2009 Chicago or 2010 Chicago. In fact the cut-off date for qualifying races was September 23, 2009, so Chicago 2009 which was run on 10-16-09 was definitely in. Apparently prior to last Monday, the BAA website indicated that for 2012 the cut-off date would be September 20, 2010, making the 10-10-10 Chicago marathon good as well. However, last Monday was a historic day for the Boston Marathon, in which registration sold out in a record 8 hours! Many qualified runners were shut out from registering for the 2011 race. This record registration began a whirlwind of questioning for the BAA about their registration process, as well as qualifying times and the cut-off date for qualifying races. Rumors are flying about the BAA perhaps changing the qualifying standards (particularly tightening up the times for women, which have been criticized for being too lenient for women compared to men). There are also indications that the date window for qualifying will be tightened. Even the BAA website, which now instead of stating that “September 20, 2010” is the cut-off date for 2012, now states “the date is under review”. So basically, I am in the same boat as many other runners, who are uncertain, whether they have qualified for the 2012 Boston Marathon. It will likely be several months, perhaps not until after the 2011 running of the race that we will know for sure. Would I like to have my Chicago time stand? Sure, but the truth is I believe I can run another race in 2011 equal or better to that (especially now that I know I only have to break 3:50 again!). A bigger concern is that I will officially qualify and still not be able to register, like so many other thousands of runners who were SOL last Monday. Another question is: will the BAA make the qualifying times harder for women, and by how much? A five minute adjustment would still be realistic for me, but beyond that it’s hard to say. Does this make me mad? Not at all. The Boston Marathon is a private, by-invitation-only event. This is why everyone wants to do it! The BAA has made adjustments to the qualification standards in the past, and has the discretion and right to do so as needed. There are a lot of faster runners than myself, who would also like to run Boston, and should be able to do so. Another thought is that the BAA may need to go to a lottery system to fairly accommodate the number of qualified and interested runners. Then you would need not only speed, but luck! In the meantime, I will continue to enjoy running by myself, with friends and racing occasionally, and see what happens. There are so many interesting local races and exciting travel opportunities to plan around running. I won’t lie; it would be amazing to be able to celebrate my 40th Birthday by running the 2012 Boston Marathon. In reality, I am thrilled to be able to even be having this discussion. When I ran my first marathon 5 years ago I was much slower and plagued with injury, and a BQ was not anything I ever thought was remotely possible. Thankfully ChiRunning has allowed me to run without injury and with better times than I ever thought possible! Back in December of 2009, our friends in Chicago asked my husband, Bryan, and I if we would join their charity team, “Miles for Magic” for the Chicago Marathon. Team members would commit to running the race and raising $500 each for the charity they started, “Open Heart Magic,” www.openheartmagic.org. It’s a wonderful organization that sends volunteer magicians into hospitals to entertain ill children. My husband had done his first Ironman in September of 2009, and was still feeling “burnt out” from that, and I had just run the LasVegas Marathon and was nursing another serious IT band injury, but we still could not refuse to help out this great cause. With 9 months to get ready for the marathon, I knew I had plenty of time to train, but not sure if I would be able to avoid the dreaded ITBS issues I have struggled with in my first 2 marathons. My first marathon was Chicago in 2005, but there I also struggled with serious IT Band issues, and had to take 3 months off of running after the race. In training for Vegas, I had ChiRunning in my mind, but my main goal was speed and trying to improve my time from my first marathon. In beginning my training for Chicago, I decided to reverse that equation and instead focus on FORM first. As soon as my IT Band recovered enough to allow me to run again (mid January), I began running very short distances (my first runs were only 1/4 mile long), choosing only a couple of ChiRunning focuses to concentrate on each run. Per Danny’s Dreyer’s suggestion in the ChiRunning book, I would set the timer on my watch and alternate between the two focuses for a given amount of time (1-5 minutes). At the end of the run I would try to hold both focuses together. Because my IT Band injury was still pretty fresh, I also heeded Danny’s suggestion to tune into my body and notice any knee or hip pain, and try to make adjustments to my form to alleviate it while running. All of this running I was doing at a very easy pace. Annoyingly slow it seemed at first, but again, I wanted my focus to be form above distance or speed. In addition to making my running very form focused, I also decided to heed another word of advice from the ChiRunning Book and start to practice the ChiRunning focuses all day long (not just when running). As often as I could remember I’d check in with my posture and make sure I was engaging my core and leveling my pelvis. I would practice leaning into the counter when I was making my kids meals, or brushing my teeth. I would also try to walk with relaxed ankles and let my toes just dangle down with each step. Around this same time, late January, I decided to sign up for the Certified ChiRunning Instructor training to be held in Chicago in May. I was not sure that I would have the technique “down” enough by then, but I figured I would learn a lot going through the 4 months of intensive home-study and practice teaching that was required prior to the training. One of the suggestions in the instructor training manual was to place a strip of masking tape on a full-length mirror to check that the points of my posture were connected (hip, shoulder, ankle). This step alone helped me tremendously. Every morning I would “check in” with my posture, by lining myself up with the masking tape. I would then take a “mental snapshot” and try to carry that good posture feeling through my workout and the rest of my day. I also began video-taping myself running every few weeks. (Yes, I would bring my camcorder and tripod to the gym and set it up near a treadmill.) Video is sooo revealing, and a lot of the things I thought I was doing I was not. One of the things that immediately popped out on the video tape was that I was running with a foot splay (feet turned out slightly to the side). It was worse on the left side, but there on the right too. After seeing this clearly on the video, I then started to take note of how I walked and stood during the day. Sure enough, I did those things with a foot splay too. I decided to make a concious effort to point my feet forward as much as possible during the day. Anytime I would catch myself “slacking off” and turning them out (which was often) I would point them forward again. It took about 40 days or 6 weeks of self-correction til standing and walking without the turnout became natural, but it happened! After 4 months of easy short distance running, I had very gradually worked my way up to about 6 miles and it was time to begin a training program for the marathon which was now only 5 months away. I wanted to follow a lengthy program that would give me time to build my mileage up slowly. I also wanted to keep form as my main focus. I chose the ChiRunning Intermediate Marathon Training Program. The program includes a workout called “Form Intervals” throughout where you alternate 2 different ChiRunning focuses throughout the workout. It also provides a sensible mileage buildup, as well as tempo and speed workouts to help you prepare specifically for your target race. In the final phase of training the plan also includes some “Yasso 800″ workouts, which are an excellent way to predict your race-pace for marathon day. Mine were indicating that my goal of 3:45 was definitely doable! I followed the plan pretty closely. I did make a few modifications along the way. For example, I kept my longest runs to a max of 3 hours, even though this mean not hitting 20 miles plus which was called for in some of the peak weeks. I also added some races ( a few 5ks and a half-marathon) in along the way, and adjusted my training weeks accordingly to accommodate harder efforts on these days. Throughout the course of my training, I noticed two huge differences from my two previous marathon training experiences. One, I did not feel any significant knee pain along the way. In my two previous trainings I had become good buddies with my ice pack, and had made ice-baths a regular part of my post-run ritual. This time my knees were very quiet, and I do not remember pulling an ice pack out of the freezer all summer. Two, I wasn’t nearly as fatigued after my long runs. In years past a 15+ mile run would definitely have my body screaming loudly for a nap later in the day. This time ’round I had much more energy, and could actually go out and enjoy the rest of the day with my family. By the next day, I’d feel fresh and ready to take on a new week of training. The hardest part of the training plan this time around was the 2 weeks of taper prior to the race. I knew the rest would be good for me, but my body was not beat up as in my previous experiences, so I was feeling a little stir crazy not running as much. Several of my friends were running the Milwaukee Lakefront Marathon the weekend before Chicago, and I remember wishing my race was that weekend too. I was raring to go! After a long wait, our race week was finally here! About a week out began the incessant checking of the weather forecast. All indications were unseasonably warm weather. How warm was unclear, but it was looking like at least mid-70’s. I like warmer weather, and we had had a very hot summer, so I wasn’t panicked – my husband on the other hand, who does not do well with the heat ,was not the least bit excited. We left the kids with the grandparents and headed down to Chicago on Saturday morning. We hit the Expo, picked up our packets and said hello to our friends at Open Heart Magic, who were there recruiting for next year. They informed us they would have a large cheering section at Mile 18 to encourage us to finish strong. I also signed up for the 3:45 pace group at the Expo. I have never run with a pace group before, but I was curious to try, and I figured I could use all the help I could get to hit my goal. We didn’t spend too much time at the Expo, opting instead to nap before meeting some friends for an early dinner. I highly recommend a day-before nap if you can swing it. That way, even if your nerves keep you up that night, you have gotten a little shut-eye. After dinner, we laid out everything we needed for the race. By this point it was clear not much was needed as far as keeping warm in the morning. The temp when we went to bed was still in the 70’s and the forecast was now for 80 degree temps for much of the race. I actually slept well that night (maybe the glass of red wine I had with dinner had something to do with it). I usually have no problem jumping out of bed on race day though. My adrenaline must start pumping while I am still asleep. Our goal was to be at the start line by 6:30, so I woke up around 5:00. I have not been having great tolerances with much of a pre-race meal lately, but I did want to allow time to get in a Power Bar and a bottle of Gatorade. I also took in a couple bottles of electrolyte-enhanced water, knowing hydration was going to be key on a hot day! I attempted to put on my pace-group tatoo, but messed up and accidentally transferred it to the plastic liner that came with it instead of my arm! Luckily I had gotten another 3:45 tatoo from the Marathon Nation booth. The splits were slightly different because it was based on a negative split plan, and the Nike pacers run try to run even splits, but I figured it would still let me know if I was in the ball park. We left the room around 6:00 and walked the mile from the hotel to the start area. I did wear a light jacket to the Start, but I tell you it was not needed. We were already sweating from the walk over – it had not cooled down at all overnight! When we signed up for the race back in March, I immediately faxed in our recent half marathon times so that we could be placed in one of the Seeded Start Corrals. I highly recommend this. When I ran Chicago in 2005, it took me 45 minutes to cross the start line, this time is significantly shortened with a seeded start. Our times were just fast enough to get us into the last of the seeded corrals, D.
It took us a while to find the seeded gear check and make our way to the seeded start area. Chicago is such a huge race, that the start area itself is several blocks long. It was about 6:45, and of course mother nature was calling with all the water I had drank, but we decided to get into the seeded corral area and use the porta-potties in there as there was already a long line forming to get into the seeded area. Once we got in there, however, we realized the line for the porta potties was quite long, but it was our only option at this point so we jumped in line. We waited about 20 minutes, and had made it about half-way through the line, when officials started coming around announcing that they would be closing the entrances to the seeded corrals at 7:15 and we may not make it if we continued to wait in line. Hmm…I knew if I didn’t go, it meant pulling over at some point early in the race, which would definitely take me out of the running for 3:45, so we remained in line. Luckily we made it to the front of the line, and into the D corral with a few minutes to spare. There were a lot of runners who did not make it by 7:15, and they were forced to scale the five foot fence to get in. I definitely would have hurt myself doing that, so I’m glad we had made it. Once in we found the 3:45 pacers (there were 4) and then my husband and I kissed goodbye and wished each other luck. He was shooting for closer to 4 hours, so he wanted to head to the back of the corral. I chatted it up with a couple of the other people nearby. I met one lady from Conneticut, who was celebrating her birthday that day. Noone else was too talkative. I did catch one of the pacers explain however that the first few miles would be pretty slow until the crowd opened up a little bit, so not to panick that we were starting way off pace. I did my as many of the ChiRunning body looseners as I could in the crowded corral, and soon enough the national anthem was playing and the gun went off! Very differently from 2005 we were moving up very quickly, and in less than 5 minutes we were across the start line. My race had begun! The pacer wasn’t kidding about it being tight and slow in the beginning. We were running elbow-to-elbow. I didn’t think I was clausterphopic at all until that day. I did the best I could just to avoid tripping on someone elses feet or tripping someone else. I also tried to weave through the sea of runners as best I could to keep up with the 3:45 pacing signs the pacers were holding. The crowds are simply amazing though, especially those first few miles where people are packed 5-6 deep in the downtown area. My adrenaline was really pumping, and I was trying to soak up all of that energy from the supporters. I also very quickly noticed how warm I was already only a mile into the race. It was going to be a hot one folks! I was glad I had decided to wear my hydration belt, as I was already stealing sips from it. We soon passed Mile Marker 1, a 9:02 pace. Not bad! Our race pace was 8:35, so we weren’t that far off. Soon we were out of downtown and heading into Lincoln Park. We were still packed in pretty tight though. At Mile 4 we were at 35:09, about 50 seconds off our goal pace. I was also quickly realizing that the bottles in my belt were not going to last me long in this heat, and I began taking in water and/or gatorade at the aid stations. Here’s where the pacers decided we needed to start catching up. Mile 5 was an 8:08 split. The next several miles were in the 8:20s. I was doing my best just to keep those pacers in sight. I found the lady from Conneticut somewhere in there. I had lost sight of one of the pacers (the one I thought I would try to stick with). She said he was worried about missing anymore splits and had bolted ahead. We still had 3 of the pacers in sight though so I figured we were o.k. By mile 7 it seemed to me that we were caught up with our splits, but the pacers still seemed to be pushing the 8:20s. What happened to running even splits? I was still trying my best to keep up with them, but I was having a hard time getting in and out of the aid stations very quickly. I would take at least 2-3 cups to swig from , plus a cup of water to dump over my head or down my shirt. The pacers, however, seemed to just bop in and out very quickly. I was also starting to get very annoyed with my hydration belt. I guess I was losing so much water weight, that it kept twisting around be and dropping lower and lower on my waist. I had added two extra bottles to the front which made tightening it on the fly almost impossible. I didn’t want to have to toss the thing (they aren’t cheap) but I was certainly getting tempted. Thankfully some very kind residents along the route had put on their hoses to sprinkle us. The race also provided a couple of locations with water soaked sponges to provide some relief from the heat. I guess they had learned a lot from that year Chicago had the 90 degree temps. I crossed mile 13 at 1:50:24. I couldn’t tell exactly if I had hit the even pace half way goal, but I knew I was well ahead of the split on my tatoo, which was based on running a slower first half. I wasn’t sure if that was a good or bad sign, but I felt pretty good (just hot) by halfway, so I was happy, and believing the 3:45 BQ was doable. For some reason the pacers continued to push hard, my next mile was an 8:01 split! I wasn’t sure what was going on. I had the pacers in sight still, but they were quite a bit ahead, and I seemed to be losing ground on them, even though my splits looked better than good. At this point the sun was blazing, and we were onto the more industrial part of the course, with much less shade. I ran my next several miles at pretty close to 8:35 pace (between 8:28 and 8:40), but I had now lost sight of all of the pacers. I hadn’t been passed by the 3:50 pacers, so I knew I was still o.k. there, but I was hoping I would pull one of the 3:45 pacers back into view. I was glad to see the Open Heart Magic Road Crew at Mile 18. Their sea of red heart-shaped balloons and our friend Mike up on a ladder with a megaphone gave me a big boost. In addition I took this as an opportunity to shove my sweat and water soaked hydration belt and 3 of the 4 bottles to one fo the road crew members and huffed “Can you please give this to Mike?” She smiled and said she’d gladly do it. I have to imagine she was a little grossed out though. Seeing them gave me a definite boost and I was able to keep up a steady pace until about mile 22. Then it became harder to hold pace. Mile 22 was an 8:53, but from looking at my tatoo, I could tell if I could get back to closer to 8:35 I could still get that 3:45. I’m not sure I believed that would be possible though, it just seemed like I was having to spend so much time in each aid station grabbing multiple cups to maintain some level of hydration. I did save one water bottle from my belt and I was frantically sloppily trying to pour water into it as I’d pass through. I think somewhere around this point I told myself that if I finished under 3:50 on this hot day, I would still be happy. Mile 23, 8:53. A little better, but not as fast as I hoped. Then came Mile 24! I don’t remember feeling particularly slow this mile, but I do remember it being the one time I drew to a walk through the aid station to make sure I filled my water bottle up. Sure enough, I paid for it with a 9:15 split. More time than I could afford to lose at this point. Mile 25 was an 8:58 and Mile 26 was an 8:49. I did manage to run the last .2 in 7:51, but again it was not enough, and I knew it when I rounded the last corner and headed towards the finish line. After crossing the line I checked my watch 3:47:23. Just 84 seconds over my needed 3:45:59. No Boston this time, but I still felt great! I was on Cloud 9 as I gingerly walked my way through the finishers chute. I took my time, got sport drink and some food into my system. Stood in a short line for a finisher photo and even grabbed my free beer! It took a while to meet up with my hubby. The heat really took a toll on him. He’s about twice my size, and as I mentioned, does not like the heat. His calves began cramping about mile 20, and he was forced to walk much of the final stretch. I helped him as best as I could back to our hotel (which seemed much farther away than it did that morning!) We ordered room service, and I had my first hamburger in about 2 years – it was good! We also celebrated later that night with a bottle of wine and some deep dish pizza. All in all this was a great experience. We raised money for a wonderful cause, I ran a race I could be proud of, and most importantly I came away injury free! If you haven’t had the chance to run the Chicago Marathon yet, I highly recommend it. It is an awesome course with amazing crowd support. Iwill say, however, you never know what you’ll get with the weather. Last year was 30 degrees! Now, the question is…where should I run my next marathon? Now that I’m up in the mid-teens with my long-run mileage, optimal recovery becomes highly important. So what are the best ways to recover from your long runs? 1. Refuel. There is a 15-minute post-exercise window when your muscles will absorb glycogen maximally. Take advantage of this by having a bottle of a carb loaded drink handy after your run. My drink of choice is low-fat chocolate milk. It has the ideal ratio of carbs to protein (4:1) to refuel your muscles post-workout. Plus it tastes good, and makes me feel like a kid again! Other options are sports drink, protein recovery drinks, or if your stomach can tolerate solid food, a bagel or banana and peanut butter. 2. Re-Hydrate Hopefully you stayed adequately hydrated during your run, but even if you did you will need to focus on replenishing lost fluids. Sports drink are a good option because they hydrate and replenish lost electrolytes. Rule of thumb: continue to drink fluids until urine is clear. 4. Stretch and roll. One of the keys of my post-run recovery is stretching out muscles that have tightened up and massage with a foam roller. Legs up the wall is also a favorite post long-run pose to help remove achiness and fatigue from your legs. 5. Compression. Wearing compression socks is one of my favorite post long-run recovery tricks. Studies show they can help reduce post-workout muscle soreness by increasing circulation to promote healing. My husband any I logged 15+ miles on the Bug Line Trail today. This was our first run on the Bug Line, and we have been missing out! The trail did live up to its name, we got eaten alive, when we made brief stops. This however, was a small price to pay for the quiet, shady serenity of this trail. With a soft and flat pea gravel surface the Bug Line will easily become one of our favored long-run routes. Word to the wise – bring extra water to plant along the trail. Although we did manage to find a porta-potty at an adjacent park, we did not locate any water fountains or pumps along our way. If you live in the Milwaukee area, and have not run, walked or biked the Bug Line, put it on your to-do list! You won’t be disappointed. 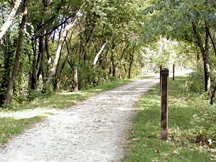 Click here for more info on the Bug Line Trail. On Sunday I participated in the First Annual Pewaukee Relay Around the Lake. The 16.5-mile course was divided into 5K segments for relay teams. I ran the last leg for my team, the Sole Sisters. This was my first relay ever, and I have to say I truly enjoyed the comraderie and team spirit of the event. There were also several individual runners doing the whole 16.5 miles solo. (It’s possible a few of them finished before the Sole Sisters.) The organizers timed this event very well for people training for fall marathons. I had run 14 miles the previous day, but will definitely keep this in mind for a training run next year. I love any opportunity to run sans hydration belt! The event’s purpose was to raise money for the Pewaukee High Scool Cross-Country Program. I highly recommend putting it on your race calendar for next year! Way to go Sole Sisters!